Symmetrical design can be easy because you design both sides simultaneously if you like something, you just add it to the other side and next thing you know, you’re done! Asymmetrical design can be a bit trickier; it’s requires a bit more moving around, trial & error, the abandoning of what seemed like a great idea in theory but, in practice, wears like a nightmare. 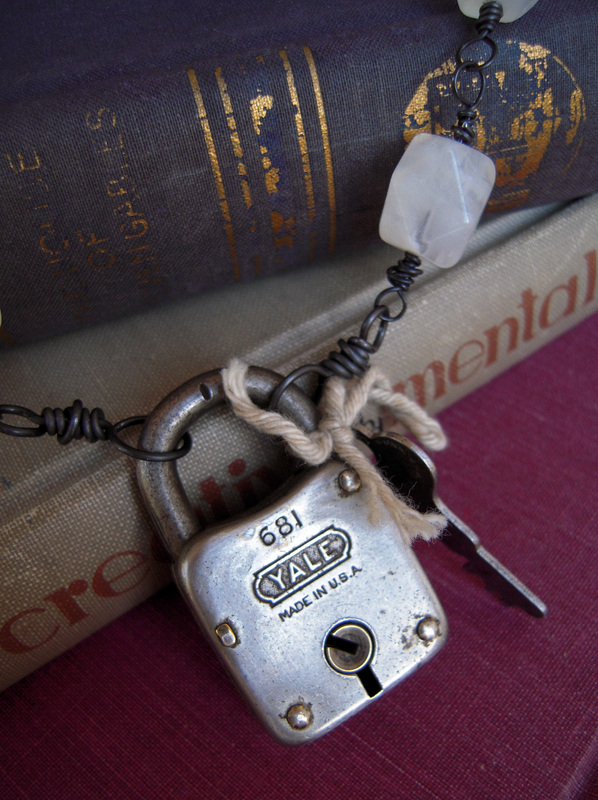 That’s a lock I found at an antique mall (I wish I’d thought to tie the key to it like that but it came that way & I loved it too much to change it. Serendipity.). I found the keys at the Texas Art Asylum. 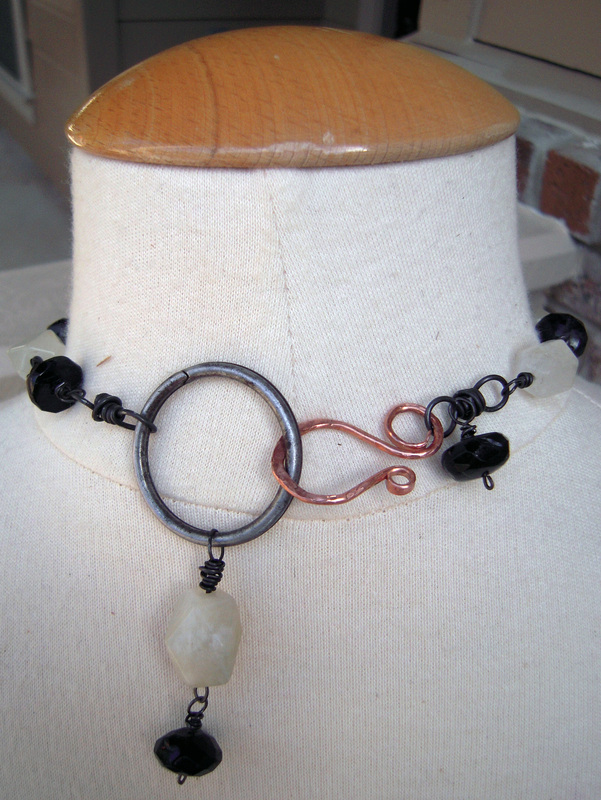 I used the steel wire again plus a little bit of copper along with moonstones and black tourmaline. 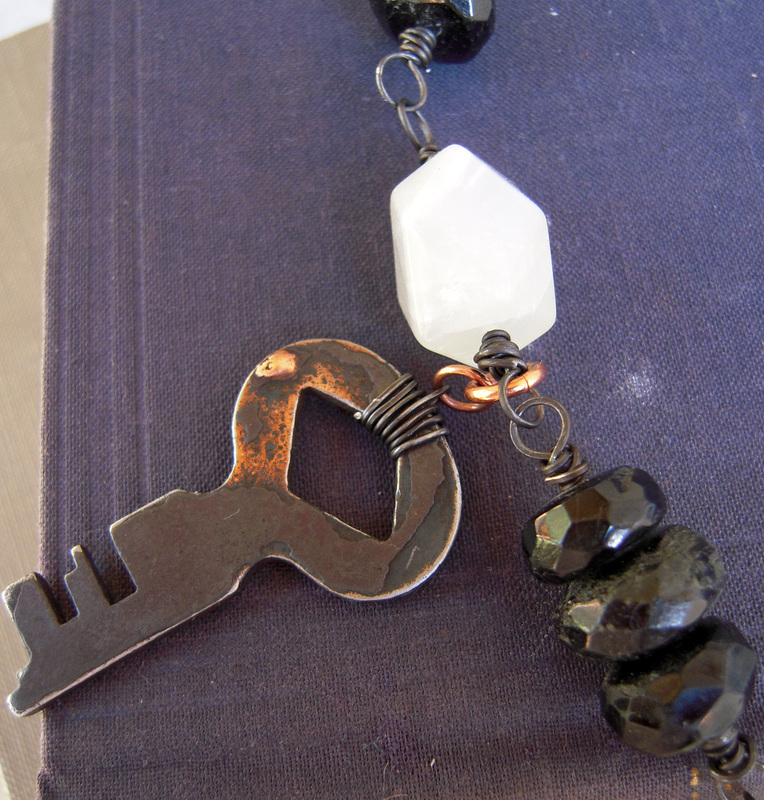 For the clasp, I used the ring the keys came on when I bought them and fashioned a hook out of copper wire. So that’s my go at asymmetrical design. Let me know what you think! Here’s the deal: In light of the events of 2012, I’m not going to be participating in any holiday shows. Let me back up a little further: on March 3rd of this year, my Dad suffered a major stroke. Life changing for all of us. I’ve been busy helping my parents out with his treatment/rehab in addition to my Mom’s treatment for her metastatic ovarian cancer. Everyone is doing pretty well, Dad’s working very hard at getting his speech and mobility back. Mom’s keeping on with her chemo treatments to keep the cancer status quo even though it takes quite a toll on her physically. Needless to say, Studio 219 has gotten a tad neglected during this time. I wanted to participate in a few holiday shows but with everything else on my plate, it’s turned out to be a more stressful plan than a fun one. Not to say that planning for shows isn’t typically stressful but this year, it’s adding stress to stress and I’ve got to let it go. Here’s a typical scenario that happens around here when I get overwhelmed and/or caught up in what I *should* be doing: I think I should be working on learning to build my website. 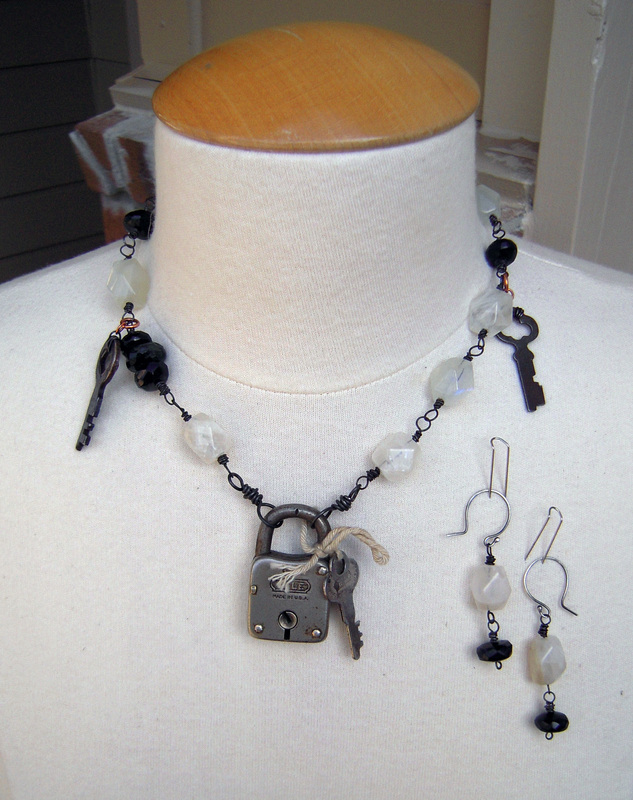 Then I also realize I should be making jewelry for shows. Then I notice that a ‘Law & Order: Criminal Intent’ marathon is on. At that point, Goran & Eames (who expect nothing out of me except my slack-jawed, undivided attention) win. So, back to the WordPress announcement. I’ve decided that instead of prepping for holidays shows, I’m going to use that time to finally (!!!) work, in earnest, on my website. I’ve made some half-hearted attempts over the past couple of years but now I’m working through a websites for artists online course & I’m starting to actually feel like I can make it happen. 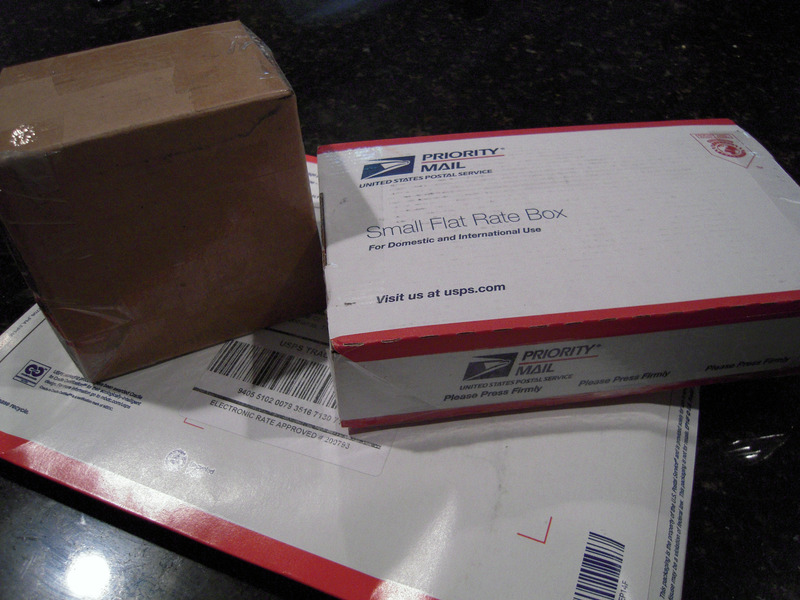 It’s going to be a lot of work (learning WordPress, re-take pictures, etc.) but oh-so-worth it! I’m also building my contacts database. Seriously. Y’all, I exported all my contacts out of my phone, cleaned up the excel spreadsheet, lined up the field mapping, then imported the remaining contacts into a database to make a Studio 219 contact database. I know! It sounds very impressive, doesn’t it? Also, I’m planning a newsletter (featuring my work & the work of my artist friends & maybe artsy-crafty things going on around here). In other words, Studio 219 is taking the fall/winter to hibernate and rebuild. So quiet, behind-the-scenes things will be happening. Be on the look out for: sneak peeks of new photos of old favorites as I work through re-taking pictures; requests to be added to my brand-spanking-new contacts database; a sign-up to opt-in for that newsletter. Of course, of course, of course, Studio 219 is still available for your holiday gift-giving needs. I’ve added a contact form at the end of this post you can use to get in touch. Or visit my Facebook page and say hello over there. Hi y’all! It’s been awhile again. I know. Life has been all kinds of in the way of me getting any creative work done. I’ve been working on some custom orders but not much in the way of anything new. So when I learned that the wonderful Deryn Mentock was offering a class built on design challenges with some great techniques thrown in, I knew it was something that *needed* to make it onto my fall calendar. My creative fires are in great need of stoking. The first design challenge = symmetry. I dug out an old pocket watch that I’ve had for at least 2 decades. 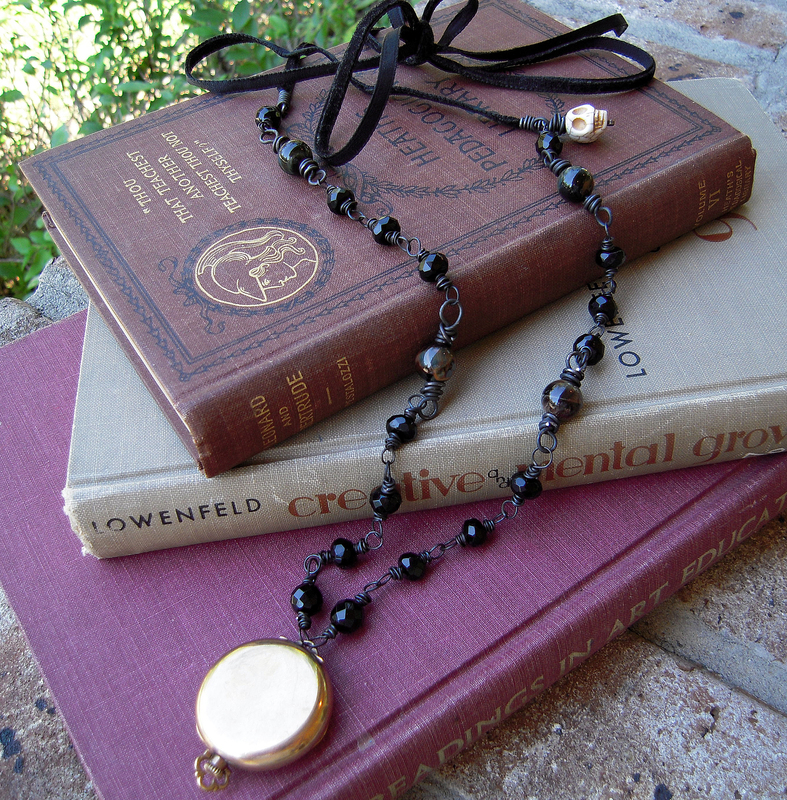 It worked fine as a necklace just on a velvet ribbon. But I decided it was time to give this old thing a new lease on life! 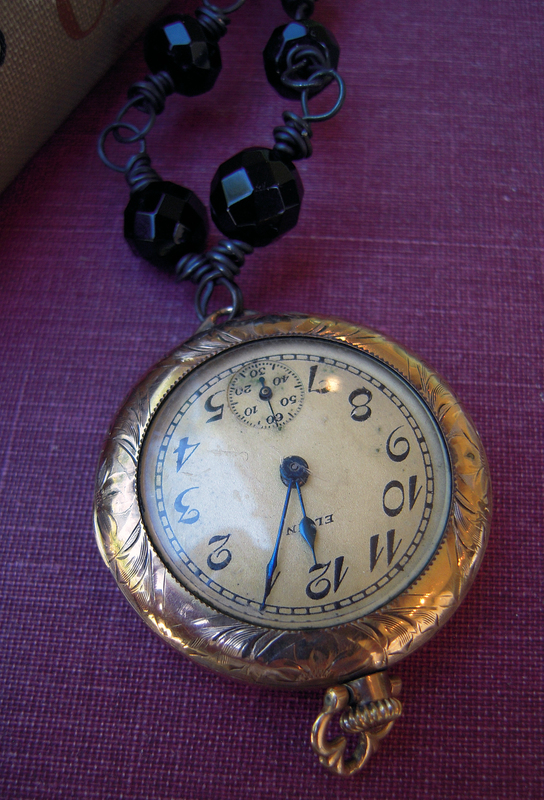 You know I almost didn’t work with this pocket watch because it’s not silver. Crazy, right? 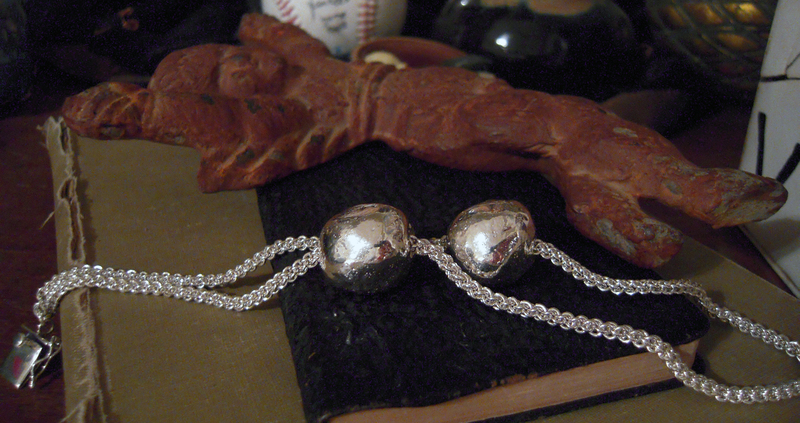 I almost always wear sterling silver (and have no plans to part with this piece!) so I spent some time figuring out how to mix the metals. I finally decided not to use any (as in NONE) silver what-so-ever. It made sense to not have any shiny, sterling silver as to not compete or look like I’m trying to be matchy-matchy with the other sterling silver I already wear. So here’s where I try something new: steel wire. 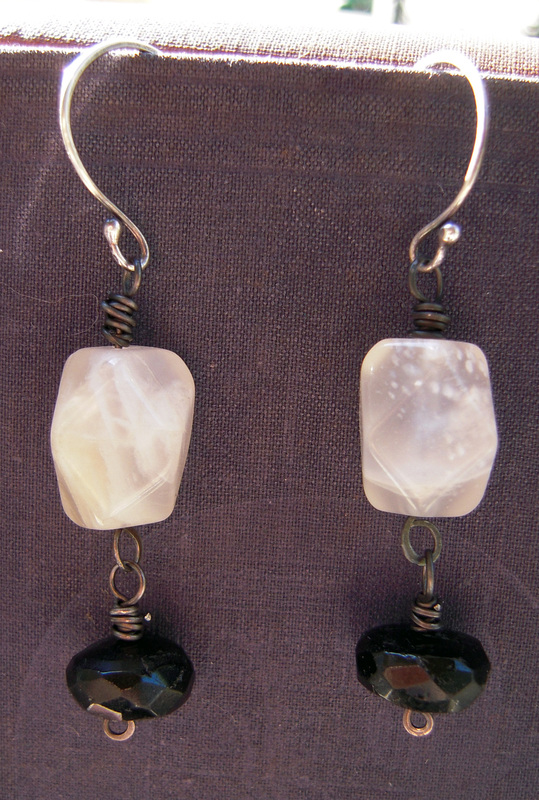 I used faceted onyx beads, of two different shapes, for variety. 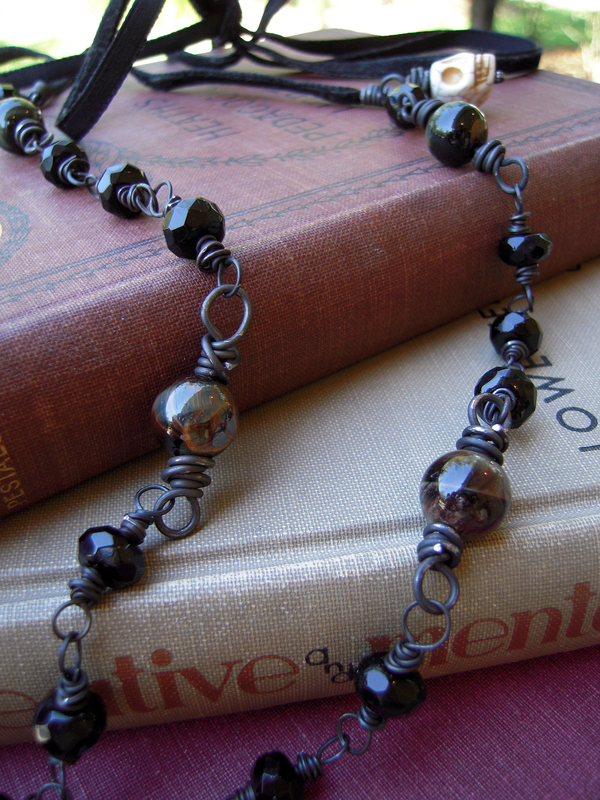 I mixed in a few smooth blue tiger’s eye beads because they are deep in color, so they blend fetchingly with the black. 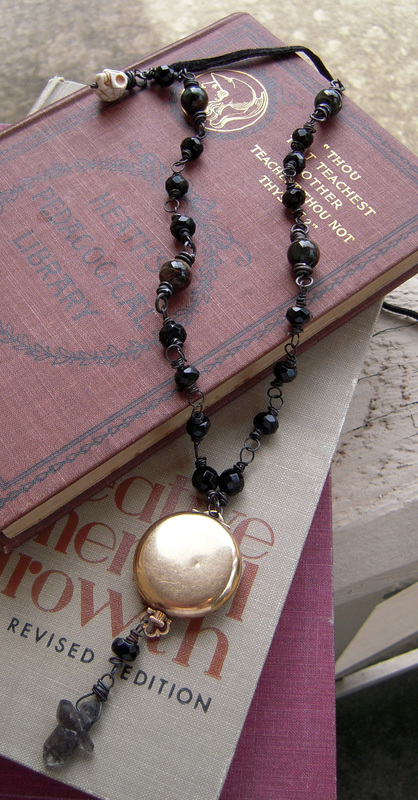 But they also have some pretty highlights that are similar to the golden shine of the pocket watch. 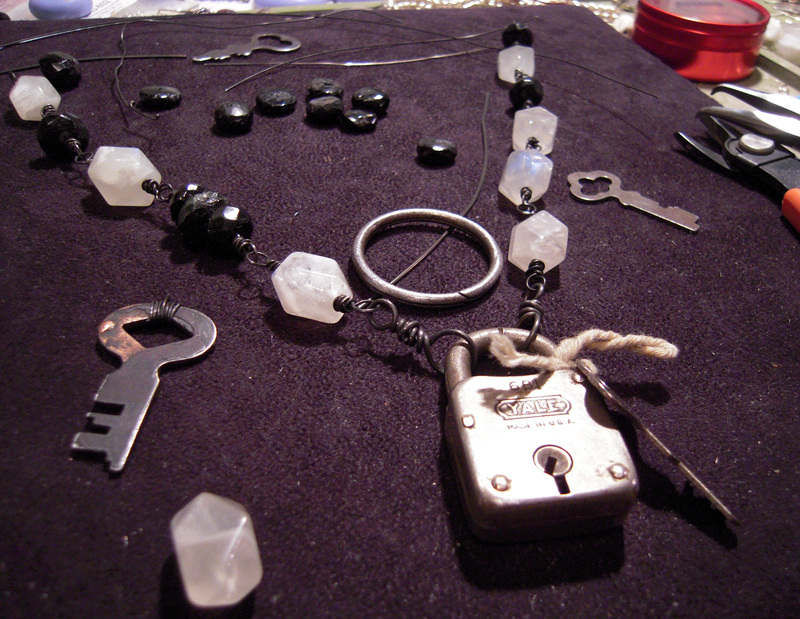 I wrapped all the links in the steel wire and then made some little springs to hold the velvet ribbon. 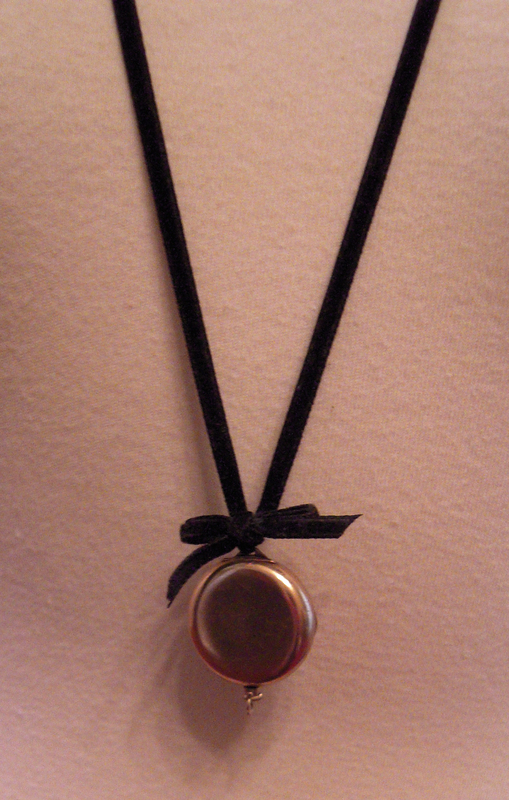 The velvet ribbon is from the original necklace and it ties in the back and I can adjust the length a bit as needed. I’m quite happy with how it turned out. I’m very interested to see how the steel wire wears. Since it’s a dark annealed variety of steel wire, I’ve got my fingers crossed that it doesn’t rub off on the white blouses I love to wear. If it passes my wear-ability test, this hardware store staple may make more appearances in my work. It’s not easy (for me, anyway) to show the variation in color in the blue tiger’s eye beads but you get the idea a bit here. As I worked on this piece I thought a lot about time and how we measure it in very symmetrical ways. The actual experience of time, however, is nothing but symmetrical; summer vacations fly by but meetings and math classes drag on forever. My mind ended up wandering past the idea of momento mori, and ‘vanitas‘ paintings. 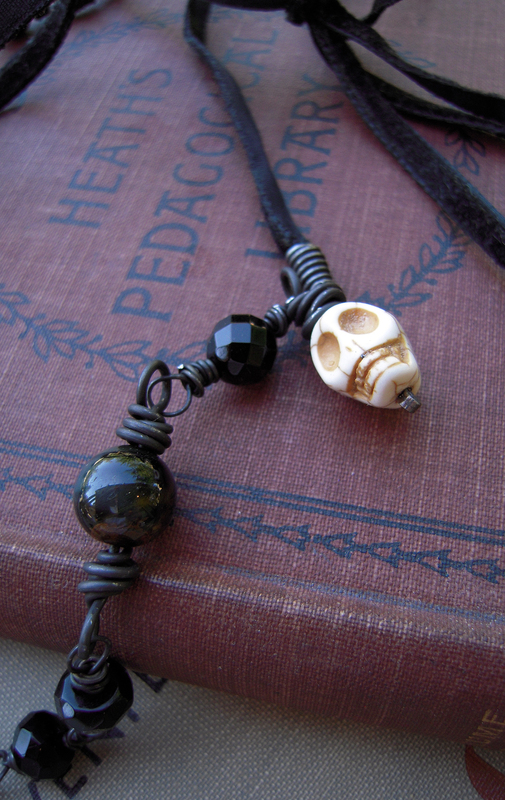 And the skull bead just seemed to fit right in along the old watch, black beads and the dark steel wire. FYI: Deryn Mentock’s Alchemy of Objects class registration is open until October 15th with the online classroom open until November 30th. The challenges will be posted during the first 6 weeks and then there’s plenty of time to stretch your creative muscles. There are private facebook, flickr and yahoo groups for support, feedback and to learn not only from Deryn (a treat!) but from the other students, too. Come join us, it’s not too late! ***Update*** I ended up adding a small quartz crystal to the watch bow and NOW it feels done! How I staved off frustration & overwhelm (this time). It’s a quarter to one. In the morning. I’ve got a lot on my plate this summer. Early in the summer (don’t even get me started on how the summer has flown by) I decided I had PLENTY of time to take on the kids being home, teaching some kids yoga classes in addition to my normal yoga teaching and practicing, plus take an (awesome) earring class AND a (wonderful) business building course designed specifically for artists. Piece of cake, right? sigh. True confession: I’m behind on EVERYTHING. And I felt it tonight. Or last night rather, right before it turned into this morning. I listened to Module 3 of the business class (even though we’re technically on Module 4 but now I’m only ONE lesson behind). Let me say Tonya’s class is SO full of an incredible amount of useful information. Which is precisely my problem. After I listened to the class: I immediately went to where I always go mindset-wise: I’ll NEVER catch up; it’s too much; why oh why am I doing this, et cetera, ad nauseum. At the end of every class Tonya reminds us to GO TAKE ACTION. So I did. 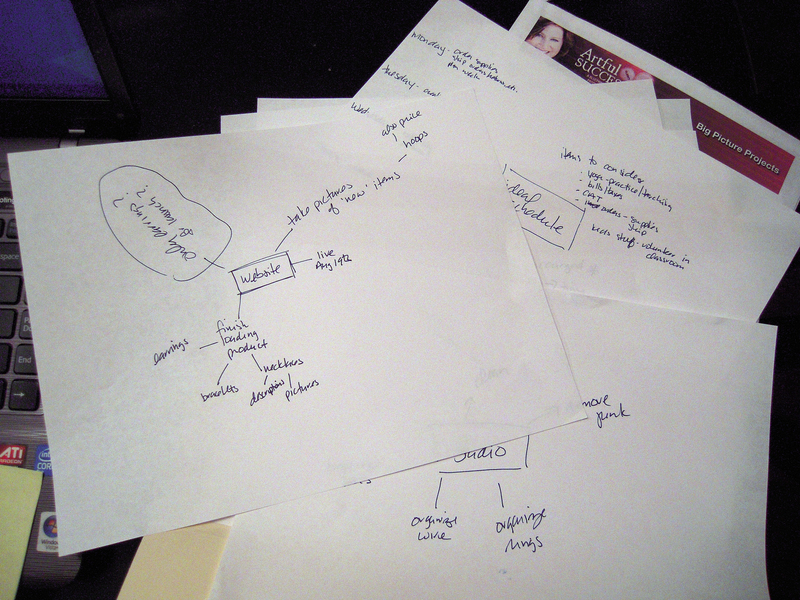 I quit whining and made a mind map for all my major projects; that way I can actually see what needs to be done and TAKE ACTION. And then I went and made something (well, sort of). A major component of the earring class is drawing a bead on wire. (for those of you that don’t make jewelry: you heat the end of a wire up until it just about melts, the metal draws up into a bead. Please hold & I’ll show you what I mean). 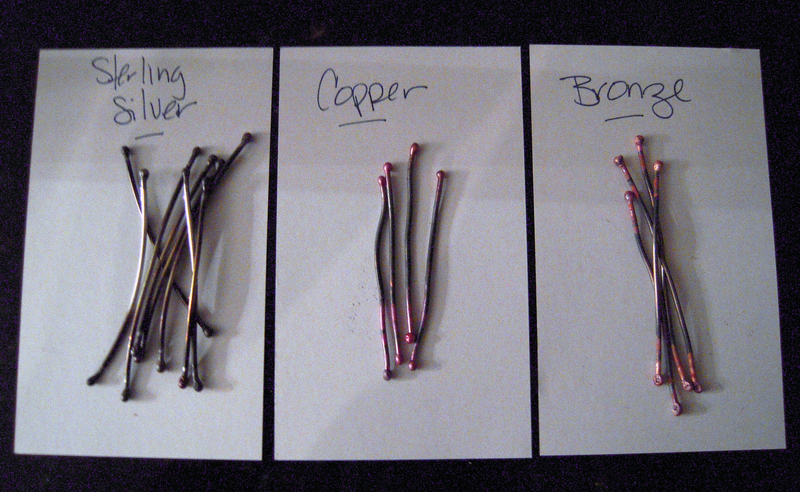 So I cut lengths of sterling silver, copper and bronze wire. 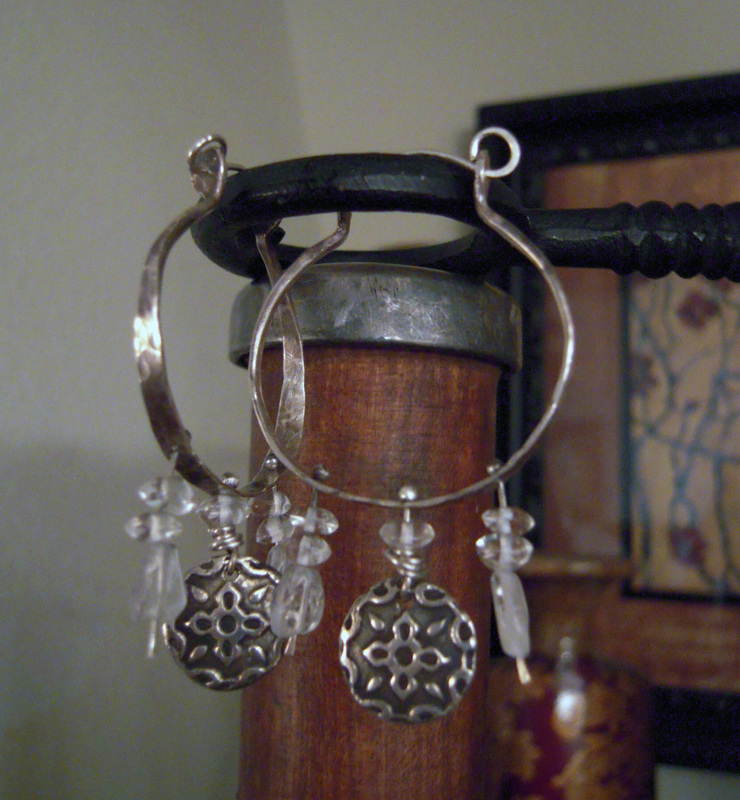 Turned on the torch and trial & error’d my way into feeling proficient at drawing a bead on all three types of wire. These may look like little burnt sticks. They are, in fact, full of the potential to turn into the hoops (and a few other types of earrings) you may have seen in this post. See those little tiny balls on the ends of the wires? That’s what I was practicing. I’ve got to say, I’m not nervous about that particular task anymore. 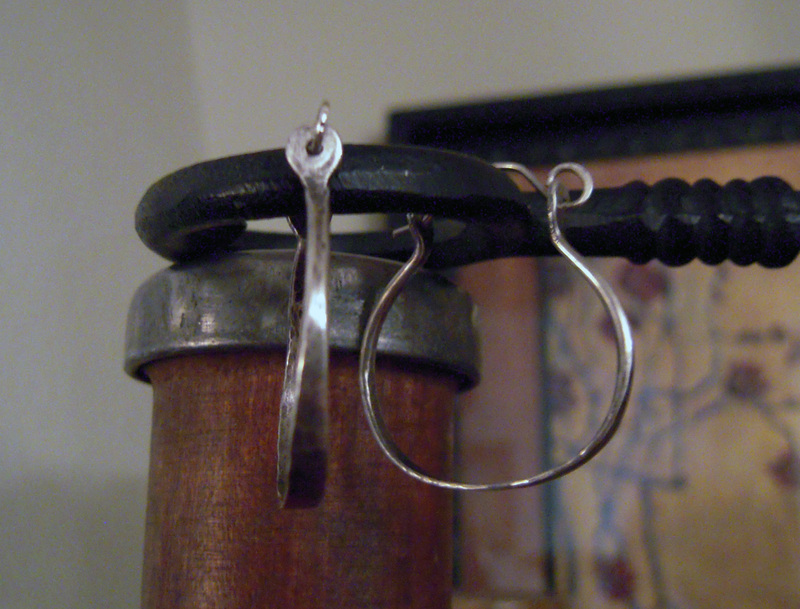 These hoops are forged sterling silver. I made every bit of them, *including* the ear wires (confession: after working through some of the lessons in the class, I’m chagrined that I haven’t always made my own ear wires. That will be changing.). It always amazes me that I forget how much I love hammering metal. I wanted garnets and I was so happy to find some in the perfect deep, deep red that I adore. Also there’s some labradorite that’s going to be lovely paired with black leather for a wrap bracelet. See all the ‘white’ beads? It’s faceted moonstone! I usually see smooth moonstone & it’s kinda, meh, to me. But I fell in love with the faceted variety; the faceting highlights the colors & lights in the stone. You’ll be seeing more of it in my designs. Yes. Those are skulls. I haven’t figured out *exactly* what I want to do with them but I was drawn to them, so now I own them. I’m really looking forward to working with all this loveliness! 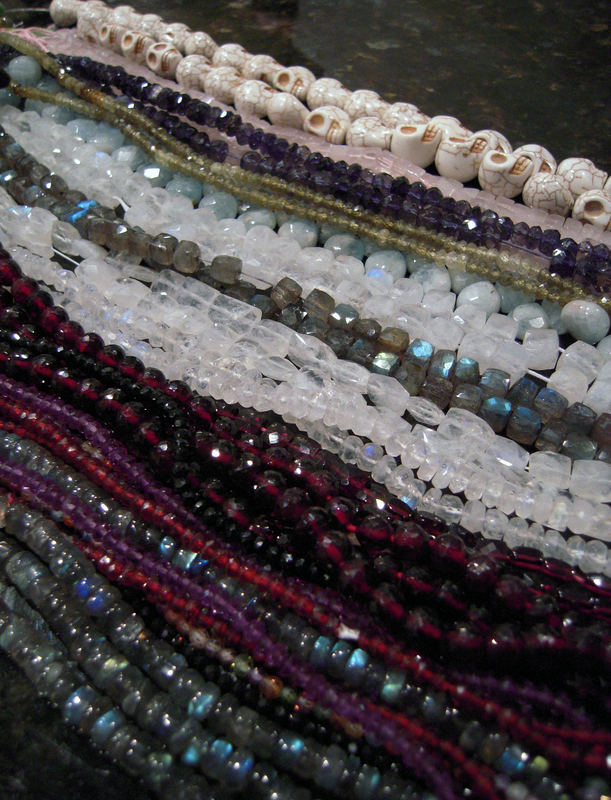 Sidenote from the bead show #1: If you’ve ever seen my arms, you’d know that I’m NOT the customer that needs the how-to-build-a-collection lecture. You can place an order for it ON MY WEBSITE! I’m [this] close to actually having a real, live, working website WITH a shopping cart! I spent time today loading the earring category. Really! My goal is to have it up and running by my birthday. That gives me just over a month. Stay tuned. Of course, I’ll be mentioning it EVERYWHERE once it’s ready. Hope you’re having a great summer. We’re having a hot (normal), dry (not so normal) one here in Houston but I’ll take the heat over the chilly any day! It’s going by so quickly, the kids will be starting school in no time. Stay in touch, say hello anytime! Feast your eyes upon the beauty of potential. 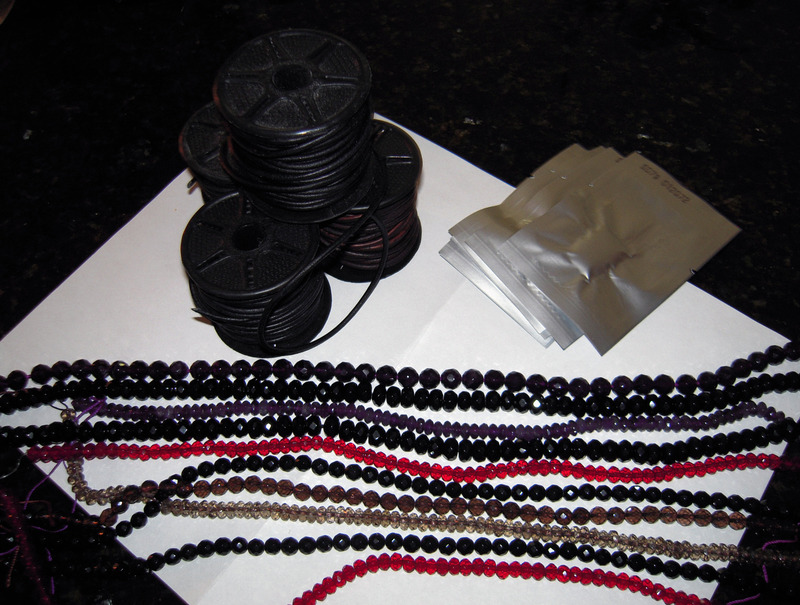 These beads and leather cord and Art Clay could become anything. But we all know this particular stash of supplies has a specific purpose. Coming up next? The making of the buttons. Stay tuned. 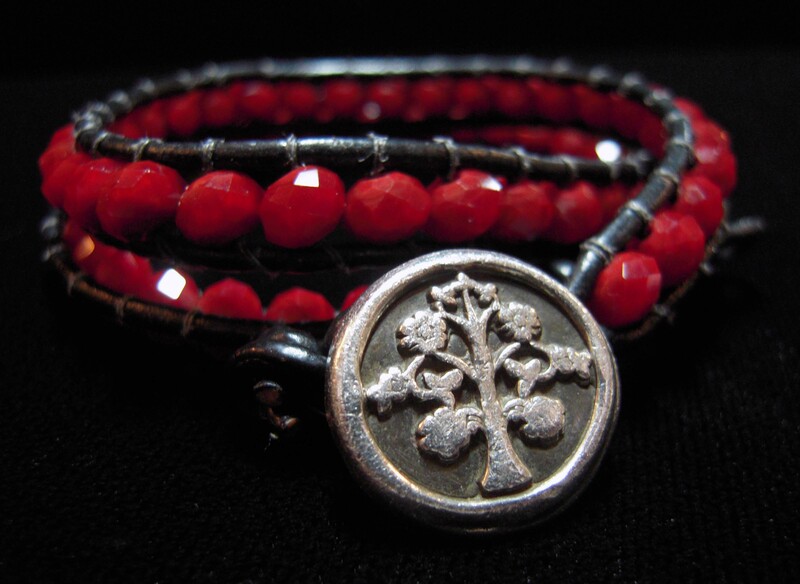 Some of you may have seen my new leather/gemstone wrap bracelets on the Facebook page. I’ve been wearing mine now for a couple of weeks. So I’ve pinpointed a couple of design/fabrication things to tighten up. I only have one big problem with the bracelet: I keep leaving it all over the place. As you may know I wear a lot of bracelets. All the time. If I had a dime for every time some one asked me if I practice/teach yoga/shower/sleep/relax on Sundays in all those bracelets (yes! ), there’s a house in Hawaii that’d have my name on it! But those are all sterling bracelets. This foundation of this one is leather. When leather gets wet it tends to stretch. So, I’ve been taking it off for to practice and to teach and to shower. 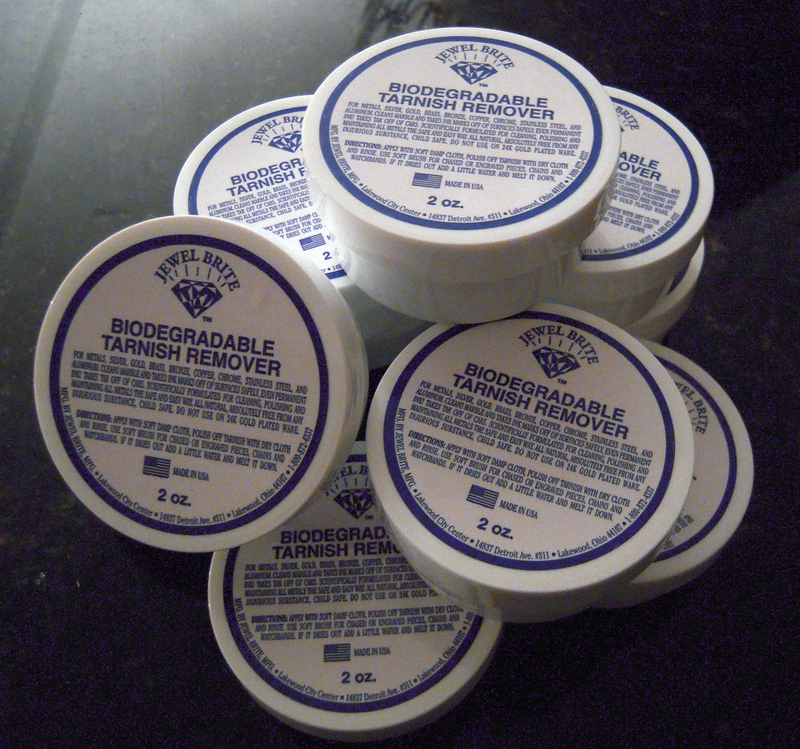 Therefore, I find it in the car or the pocket of my jeans or on the counter or in the deep dark recesses of my yoga bag. Other than that I love it! You can see it mixes in lovely with silver. Here’s where I need your help. I need to practice making more of these, the ‘sewing’ part is rather new to me. I could also use some practice getting the dimensions and other design details ironed out. The buttons are good, but I could be better, neater, cleaner with those. 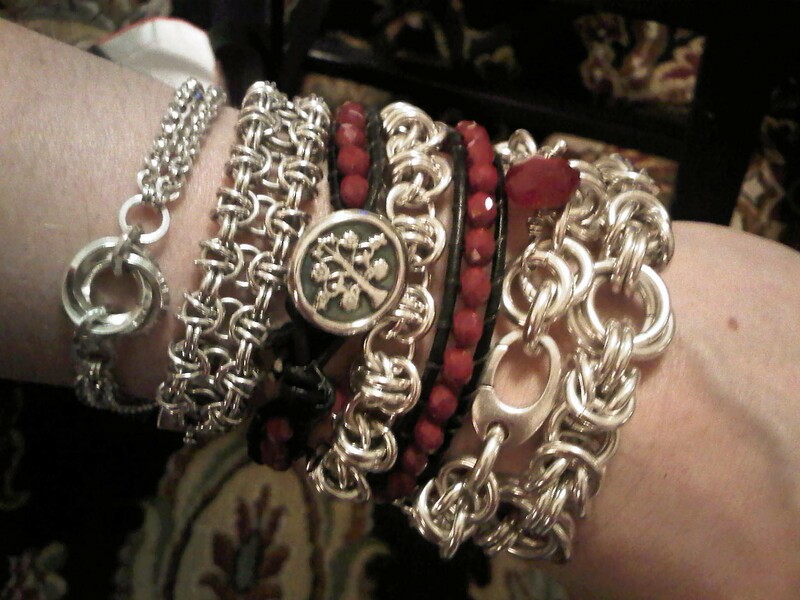 So rather than make another 10 for me, I’m giving you the opportunity to buy-in to my first 10 of these wrap bracelets. 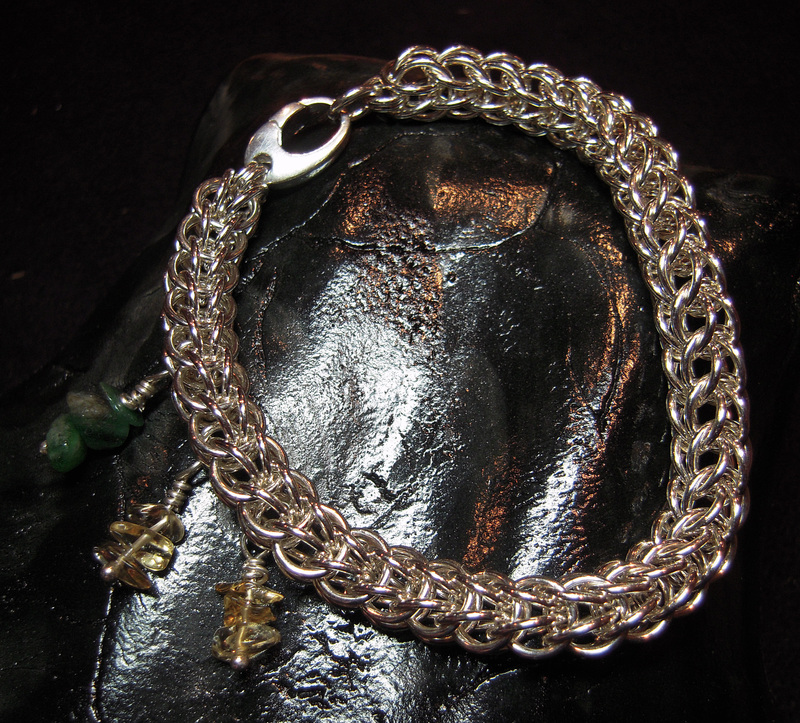 Once I get the making of the bracelets streamlined, they will sell for $85. For the first 10, I’ll be offering them at $65. Not only will you get a discount but you’ll be among the very first to own one of these lovelies. Trade-off: your button might be a tad off-center, there may be a bead that needs to be coaxed back into place every so often, or some other minor, minor imperfection. 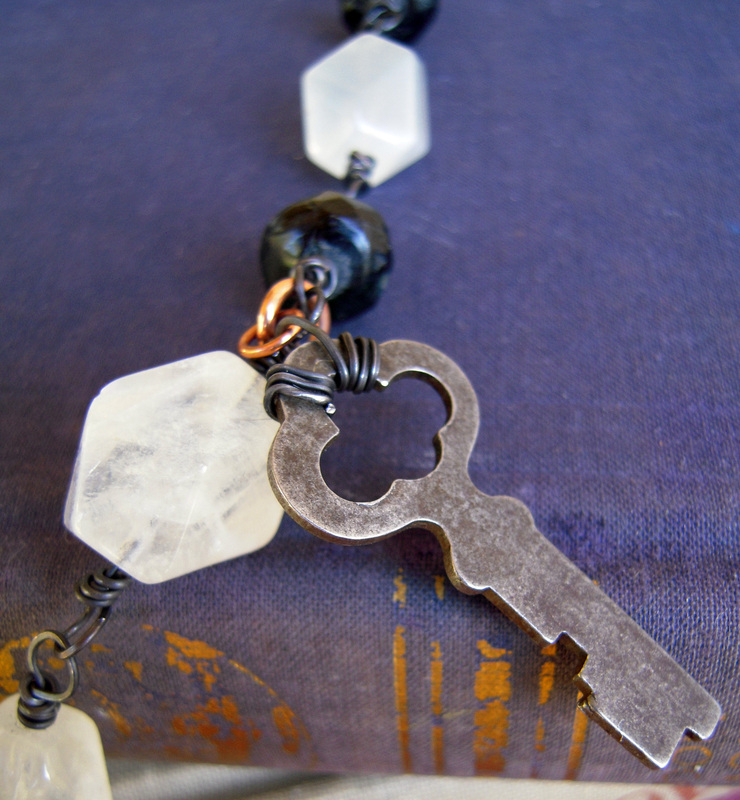 Right now, I’m planning on making the ruby quartz/black version (as seen here), an onyx/black and a smoky quartz/brown. There *is* the possibility I could be talked into taking requests. The button I’ve worked on so far is the ‘Tree of Life’ (again, as seen here). I haven’t decided what or if there will be other options. 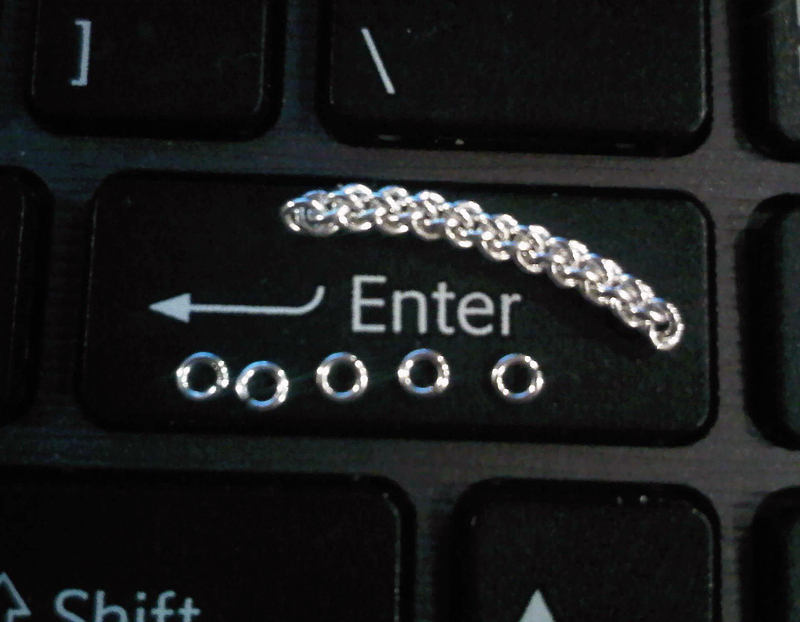 When you sign on to help me out here, you’ll be in on this bracelet as the details get hammered out. We’ll definitely be in touch via email and the Facebook page. And I may ask you for your feedback after you’ve worn the bracelet out & about. Remember the article about me and my jewelry that ran in both The Woodlands & Cy-Fair editions of Lifestyles and Homes back in June? I’m pretty pleased to say that it is in the Houston edition for August! And it’s my birthday month! Here’s the link directly to the article online. Yay! I’m a summer re-run! I was teaching myself the full Persian weave a few weeks ago. Lovely weave. Lots of potential. 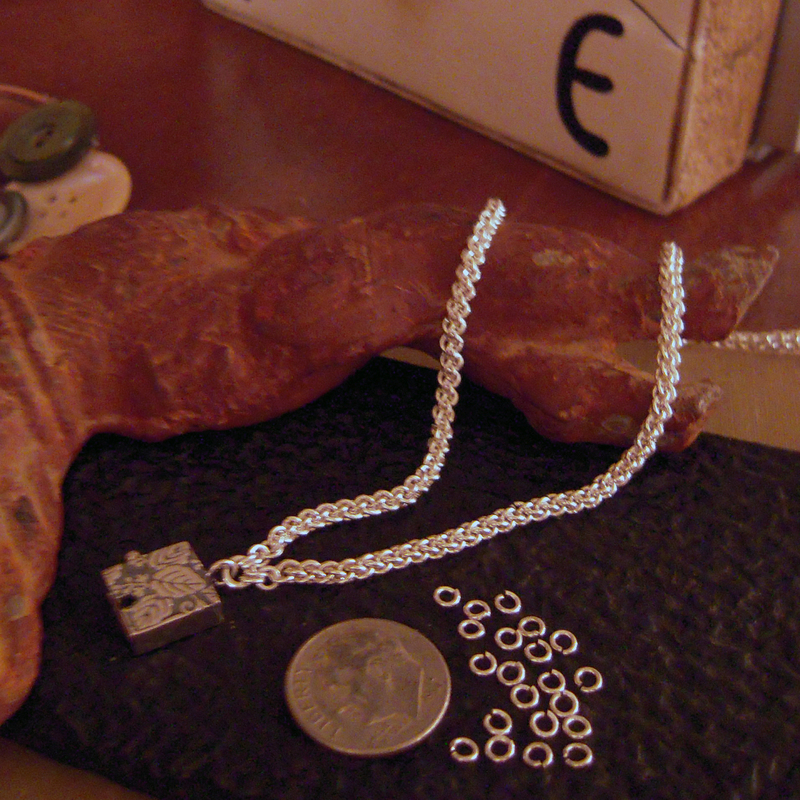 Thin & ropy for necklaces, chunky & weighty for bracelets. 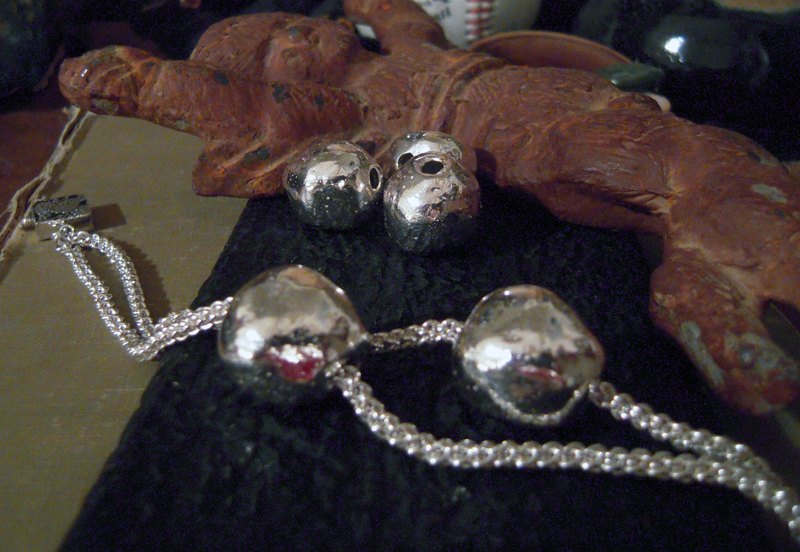 Or chunky & weighty for necklaces, thin & ropy for bracelets. Like I said: potential. Then my sister had her baby. So.. The charms are (from left to right): Emerald, Citrine, Citrine. Or May (new baby 2010), November (Baby Boy 2000), November (Baby Girl 1999). A bracelet conceived from a traditional need to celebrate motherhood. But that can be worn and given in appreciation of any of the ways Mothers, in all their myriad of incarnations, touch our lives. And my take on the Mother’s Bracelet was born. Have a question for me? Want me to make you something? Want to say hi? Follow me here: Twitter Answering the question: what are you doing?